Welcome to the official SHE Pab: Voices of Hmong Women website! 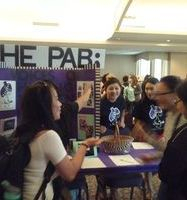 SHE Pab: Voices of Hmong Women is an organization/club at St. Catherine University (St. Paul, MN) founded in 2012. SHE Pab is devoted to promoting Hmong culture, language, arts, and history to the St. Catherine community along with publicizing the Hmong Minor Program (which is newly established at St. Kates). We are devoted to enhance cultural awareness and appreciation through community services, and discussions on current local, national, and global Hmong issues. SHE Pab is determined to create a network of opportunities for St. Catherine students through events and collaborations on and off campus. We hope that through this club we will not only gain knowlegde about our culture, but to see ourselves as powerful individuals who can do anything if they put their hearts and mind to it. Its been a tough journey for us, but we made it. Remember CELEBRASIA is this Saturday! Asian Women's Association (AWA) will be having their annual event, Celebrasia, this Saturday, November 14th from 7-11pm. Come and celebrate different ASsian cultures through entertainment, appetizers, and activities. This year SHE Pab is bringing a film festival to YOU! With inspiration from Qhia Dab Neeg we are inviting aspiring film makers or people who have a passion for expression through film to submit videos to be potentially screened at the Jean de' Arc Auditorium at St. Catherine University. With this film festival, we hope to expose aspiring artists to the community and raise awareness of the various perspectives on the Hmong community ranging to culture and tradition. The theme of our festival is "Hmong" and we are open to accepting films that deal with any issues, culture, or traditions that relate to the Hmong. You can find the guidelines and submission form under the Forms tab. They will be under 2015-2016 School Year. Attached with the form are a FAQ to better assist and questions you have. Please submit your final video and the submission form to Google Drive and share with [email protected]. For questions or concerns, please feel free to contact [email protected]. We have changed our location for our social! Remember to come to our social tomorrow! It is from 12-1 pm, in Whitby, room 218B. Come and meet our board and advisors! St. Kate's just had their Activities Fair today! It was lots of fun and the board met many new people. Many people signed up for our social which is next Thursday the 1st. We hope that you all will also come to our general meetings. We have new themes this year along with exciting events, so please come and joins us at our social on October 1st from 12-1 pm, in the Whitby room 218B. Make sure to come, there will free food along with getting to meet the board members and SHE Pab’s advisors. We will also talk about our themes for the year so come and eat and mingle and get to know one another!